After the Pakistan – China friendship over the massive China Pakistan Economic Corridor, a project that is bound to shape the future of the country. As time goes by, we’ve seen a number of Chinese citizens settling into Pakistan and it finally seems that a merging of cultures has now begun. CPEC is an outright personification of a firm friendship between neighboring countries of China and Pakistan. People back this project and anxiously await the offspring in terms of development it would bring. 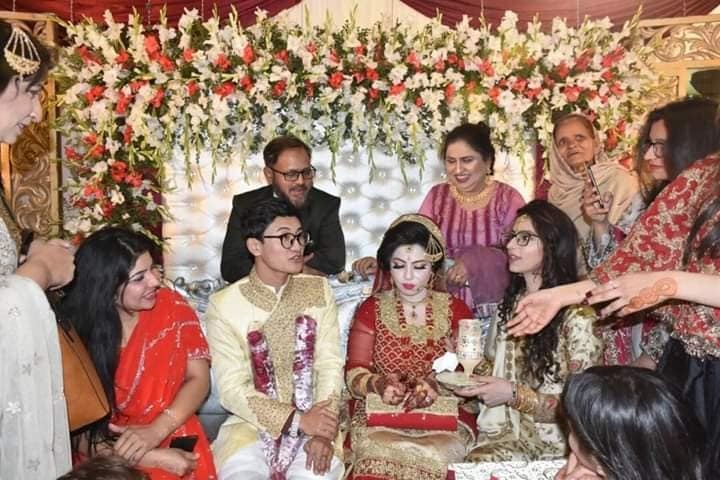 Besides the CPEC bringing all the better economic estate we should be geared up to witness a lot of Chinese people around and that means there will be more cross marriages in Pakistan two different ethnicities. However, it looks like that’s already shaping up! 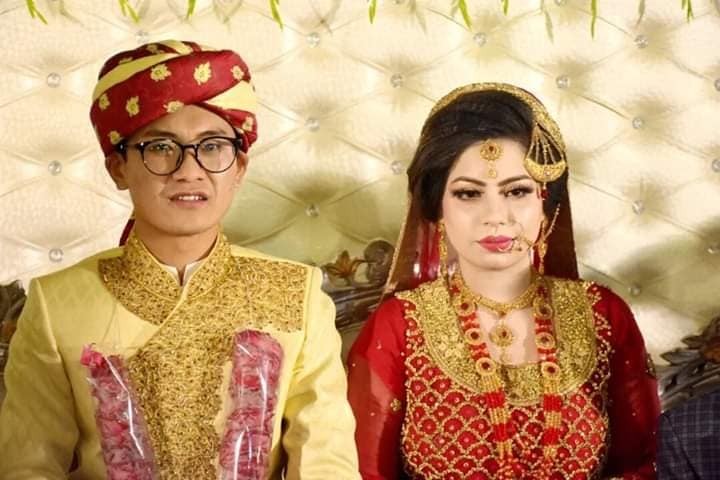 There have been wedding between Pakistani and Chinese and there’s one more that makes it to the list. 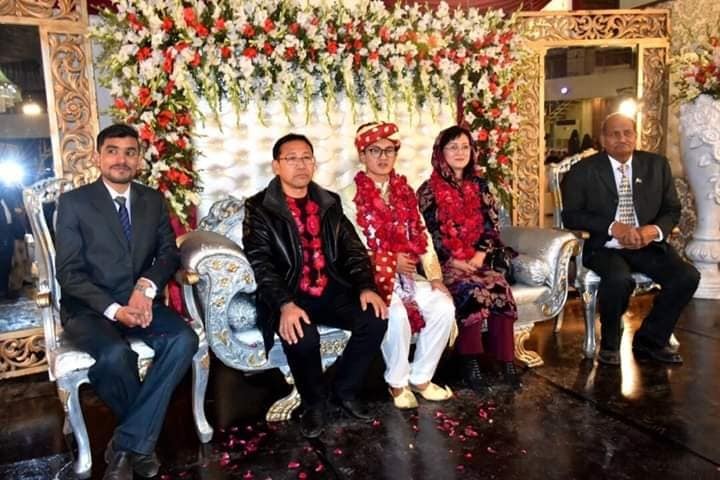 Xu Long & Fatima held a wedding ceremony in accordance with traditional customs of Pakistan. The bride was wearing a classic red Jora while the groom also complimented her in a traditional sherwani. The couple looked super cute together and the families are super happy. Here are a few pictures of the duo! Isn’t this a great sight? This is just adorable you guys! We stumbled upon this tweet and wanted to show you all how loved and appreciated the couple is! 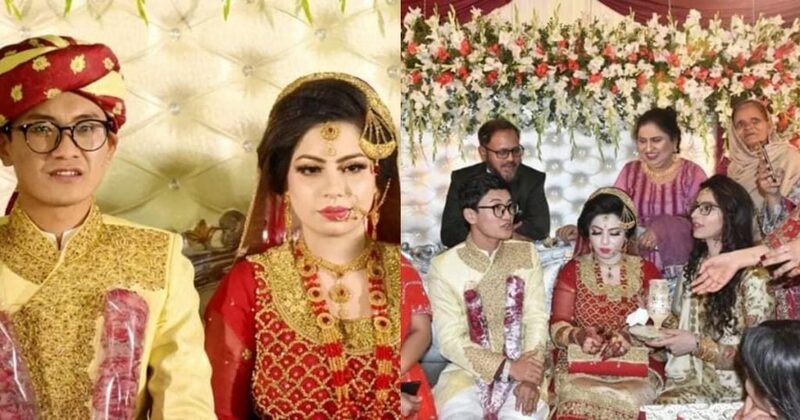 Xu Long & Fatima held wedding ceremony in accordance with traditional customs of Pakistan. Have a look at how people are showering the couple with all their blessings! This user sends his prayers their way! Lots of prayers and best wishes for the couple, praying that they have a spiritually content married life full of laughter joy and happiness. Hilarious!! But wonderful that we’re exchanging culture and traditions, this way we are heading to healthy and friendly relations with Chinese at every part of life. One Belt One Road wedding underway. May you live happily ever after when CPEC has completed. It looks like good things are coming our way, both economic and personal! we just might see more Pakistani women tying the knot with Chinese men but this also means that our local men need to take it up a notch to sweep women off of their feet! May God bless the pair and shower them with his blessings!